None of us would be who we are today without the influence of the books we’ve read throughout our lives. And for those of us who are writers, books have shaped us so much we have chosen to write them ourselves and hopefully leave behind works that resonate with a new generation of readers. As a way of giving thanks, I’m going to hand write thank you notes to five authors for the impact they’ve had on my life. I’m so excited to kick off the #ThankAWriter project with my good friend Maggie Mason, who blogs at Mighty Girl, and is one of the cofounders of Go Mighty, a site built around making a list of your life goals, finding people who can help you achieve them, and sharing your stories as you complete them. My profile is here. One item on my life list is to give thanks to my favorite authors. So once a week over the next five weeks, Maggie and I are going to hand write thank you notes and then mail or deliver them and post our stories about it. Please join us in this project! It’s super easy and will be very rewarding. Maggie and I will also be linking to some of our favorites. 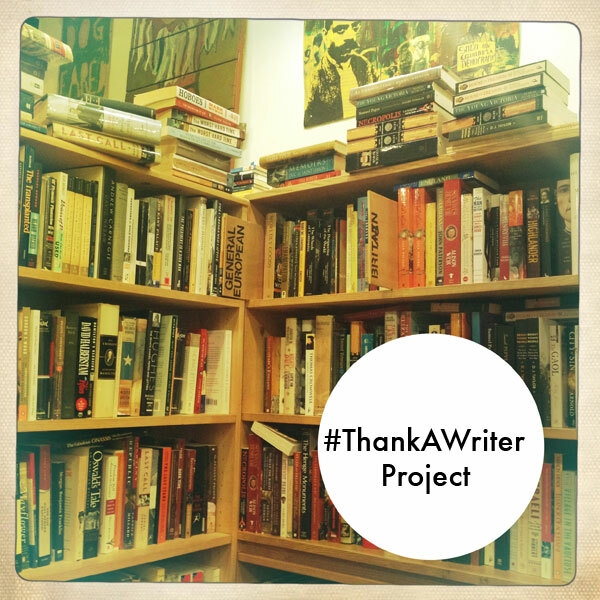 3) Every time you write a thank you note, post a photo or the text as a story on GoMighty with a #ThankAWriter tag. Like this one. You can see all the goals and letters here. 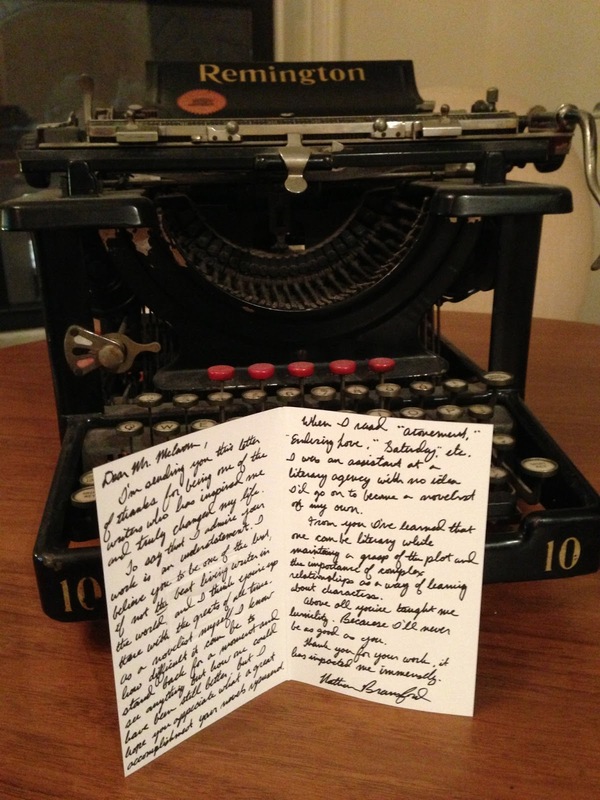 I’m sending you this letter of thanks for being one of the writers who has inspired me and truly changed my life. To say that I admire your work is an understatement. I believe you to be one of the best, if not the best living writers in the world and I think you’re up there with the greats of all time. As a novelist myself I know how difficult it can be to stand back for a moment and see anything but how one could have been still better, but I hope you appreciate what a great accomplishment your novels represent. When I read Atonement, Enduring Love, Saturday, etc., I was an assistant at a literary agency with no idea I’d go on to become a novelist of my own. From you I’ve learned that one can be literary while maintaining a grasp of the plot, and the importance of complex relationships as a way of learning about characters. Above all, you’ve taught me humility. Because I’ll never be as good as you. Thank you for your work, it has impacted me tremendously. Nice project. I actually enlarged the image and struggled to read your handwriting … only then did I see that you'd transcribed it for us. Still, in the same way it's almost always better to read the book before seeing the movie, I preferred it that way. Yeah, my handwriting has seriously deteriorated due to lack of practice the last few years. McEewan's Saturday was a huge help to me as a writer; one of my novels exists solely because of that book. Is it too cheesy and cold to type a note because no one–not even me–can read my handwriting. I am so doing this! Writing my notes today. Well, to the living ones because notes for the dead creep me out. I think this is a great idea. I'm jumping on board and for the next five days, I'm going to give thanks to five authors/writers who influenced me starting with Theodor Geisel. The key is finding an address for an 87 year-old who has managed to keep herself relatively hidden from the computer world. What a wonderful project! I'm in! Very cool idea, and the handwritten touch is perfect. I got three letters just like that I've never sent. One was to Ray Bradbury, and now it's too late. Great idea! Though it also makes me a little sad to think that some of the writers I would love to be able to thank for making my childhood a little more wonderful are no longer with us. Still, for the ones who are, this is an awesome idea. This is so awesome. Personally, I've been extremely fortunate in that I've had a chance to meet my favorite living author, and share some excellent single malt with him. I love this idea! And I can only imagine how fantastic it must feel to be the authors who receive these letters. I love this idea for myself, and I've also passed it on to our children's/teen librarian to use with the book groups. It's a nice idea, Nathan. Ursula le Guin, maybe, and the author of Interview with a Vampire, Anne Rice, are two writers who've given something special to my reading and writing experience. Ooh, I so love this idea. I'm on board! I think I will also have my 8th-grade English class participate for just one favorite author. I know they will really get into it. Love this idea! Only problem is narrowing my list of 76 (and I know there's a ton more but by brain hurt after thinking of 76)down to five. This is recommended by Carolyn See in her book, "Making a Literary Life." I actually wrote her a note after finishing her book because I enjoyed it so much. Unfortunately, I haven't kept up with this exercise, but your project reminds me how important it is. AHH! What a great project! I am hopping right up on this bandwagon.